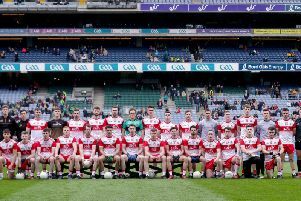 DERRY SFC: Saluting Derry’s ‘Double Double’ winners! Good teams win Championships. Great teams retain them. Where, then, does that leave a club that retains a Senior Championship ‘double’ and adds the county’s senior camogie crown for good measure? Probably filed somewhere inside a secret GAA file labelled ‘Remarkable Clubs’. It wouldn’t be a big file. Slaughtneil reaffirmed their status as kingpins of Derry GAA by doing what champions do - they found a way to win. The final was not a spectacle that will live long in the memory but the Emmet’s feat should. It is a special club that can come back from the disappointment of the All Ireland Club final defeat in March to reclaim both Derry titles. And the hurling title goes hand-in-hand with the football with so many players involved in both codes. The disappointment for Coleraine will be they waited until the game was lost before throwing off the defensive shackles which had limited their display to that point and, in the end, almost managed to turn the game around. That leaves a huge ‘What if’ for the Eoghan Rua players and management team but you need to take chances to win and their conservative approach early on handed Slaughtneil the impetus from which they built the platform for victory. And Slaughtneil are one team that doesn’t need a helping hand. The most impressive thing about the Emmet’s 2015 Championship success was it was achieved without ever really hitting top gear. They have been controlled and clinical which probably best sums up their performance in Sunday’s final. After Colm McGoldrick’s excellent opening point, the defending champions dominated possession and steadily built a 0-3 to 0-1 lead but they were soon pegged back by a Coleraine team who hit only five shots during the opening 30 minutes, scoring three times. They were defending well though and winning turnovers but their deep starting position meant they struggled to get up to support an attack that had the potential to trouble the champions. ‘Man of the Match’ Paul Bradley, brought a forgettable first half to a close with Slaughtneil leading 0-4 to 0-3. Bradley increased the lead and when his long range free dropped perfectly for Se McGuigan to ghost in and punch Slaughtneil into a match winning position it looked game over, ‘Sammy’ Bradley adding an extra point for 1-6 to 0-3. One of those scores was Ciaran Lenehan’s 52nd minute effort which looked a certain goal before brilliant defending from Barry McGuigan forced him to shoot over the bar. That won the game. Barry McGoldrick sent a crucial free wide late on but Slaughtneil would not be denied. GAA historians will have to dust down that secret file for a new entry!